For anyone interested in a first-hand, up-close-and-personal view of the Roman Catholic experience in Manhattan—one that includes more than standard visits to a handful of famous churches—look no further than An Inspirational Guide to Catholic New York City. Seasoned journalist Sharon Hazard and noted historian George J. Lankevich have joined forces to create an extraordinary pictorial travel guide that takes you on this unique journey. The journey starts with a brief overview of the history of the Church inManhattanthat begins in the early 1800s with the arrival of the first Catholic immigrants inNew YorkHarbor. Next comes a guided tour of hundreds of noteworthy Catholic sites throughout the city—district by district. Beginning at the tip ofManhattan, and continuing upward to the Lower East and West Sides, throughout Midtown, along Central Park, and into Harlem andUpper Manhattan, you’ll visit the places of interest in each area. The journey will take you from small neighborhood parishes to magnificent world-renowned churches. You’ll discover important monuments, museums, public squares, statues of prominent Catholic figures, and other notable sites that resound with historical Catholic interest and charm. Hundreds of magnificent full-color photographs add visual appeal to this comprehensive guide, while dozens of insets offer fascinating stories on the people and places within. Rounding out this book is a select number of relevant Catholic places of interest located in the Bronx, Brooklyn, Queens, andStaten Island. 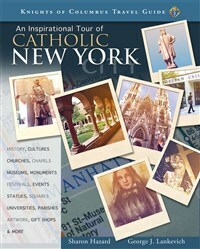 Whether touring the city’s tiny ethnic parishes or its magnificent St. Patrick’s Cathedral; whether visiting its noted monuments or its lesser-known neighborhood squares, there is no better way to gain insight into the Catholic influence in Manhattanthan by exploring it with An Inspirational Guide to Catholic New York City. George J. Lankevich received his PhD in American History from Columbia University. He taught for over thirty years in the City University of New York, where he is now a professor emeritus. Dr. Lankevich is the author of over twenty volumes of history, including New York City: A Short History, Postcards from New York, and Postcards from Times Square. Sharon Hazard is a graduate ofRutgersUniversity inNew Jersey. As a journalist, she has served as reporter and editor. Her feature stories have appeared in numerous newspapers and magazines. Ms. Hazard is also the photo editor for three books onNew Jersey history.